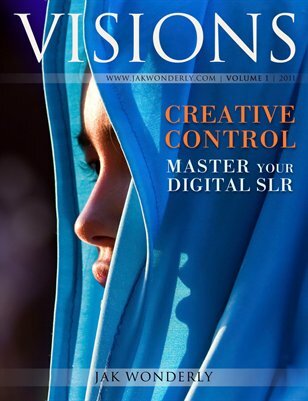 VISIONS is written by a National Geographic published award-winning photographer and is intended for the beginning to intermediate digital SLR camera user. This workbook is designed to be the most efficient material available to aid in understanding the basics of exposure and camera controls to consistently creating powerful images. CREATIVE CONTROL pushes you to approach outdoor subjects in the same manner as a professional photographer. It leads you from the aesthetic impact of changing depth and field and freezing or blurring action to advanced concepts like how to use lens compression and expose for maximum color saturation. Based on the material presented in photographer and writer Jak Wonderly’s sell out weekend workshops, this concise but rich reference guide can be a companion for tremendous growth as a photographer. Please note his book does not cover post-processing, studio lighting, or off-camera flash.